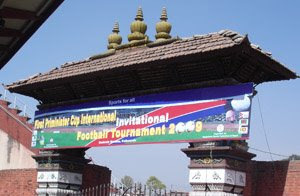 Six teams were invited to the ongoing Prime Minister's Cup football tournament - 2 "B" National Teams from the same country (Nepal Red and Nepal Blue), 2 Clubs (Bangladeshi top division side - Arambagh and a third level side from Thailand - JW), and 2 National Teams (Pakistan and Sri Lanka). This mix of teams is certainly quite unique for a football tournament, but one which was poorly conceived. What does the public and the national team get out of playing in such a tournament? First off, since the tournament has such a variety of teams, it does not qualify as an official FIFA friendly, thus it will not affect the FIFA World Rankings. Nepal's top players are divided in two camps and therefore lose the opportunity to train and play together as a single team. How do we judge Nepal's result against Sri Lanka and Pakistan when only half the national team featured in each of the games? What do we learn from Nepal's match against a 3rd division Thai club - when surely the Thai National Team will consist of much faster, more skilled and perhaps bigger players? It's like Iceland playing an English 3rd division side to prepare for the likes of Terry, Gerrard and Owen. Seeing that two national teams accepted an invite, would it not have made much more sense just to have a four team tournament consisting of Nepal (a single team), Sri Lanka, Pakistan and a forth national team? With the money the organizers save from dropping two sides, they could have easily enticed a regional national team to participate in the tournament. All teams would play a minimum of 3 games, the matches would count in the FIFA Rankings and we would have much better insight on Nepal's national team. Seems so logical, no? It looks like this tournament was organize in a hurry. Also there was kind of competition between two FAs ( ANFA and NFA) who is organizing 1st Prez. cup & 1st PM Cup , somehow ANFA technically supported one of the political party to organize this 1st PM cup.